Volkswagen has opened the door to union representation at its Chattanooga, Tenn., plant. The automaker announced a policy in mid-November allowing several labor groups, including the United Auto Workers, to represent workers depending on the percentage of their membership among the plant workforce. The new policy gives the UAW potential clout at the plant but does not make the union the sole bargaining representative. The move may allow Volkswagen to set up a works council at the plant — a committee of employees and managers who work on day-to-day issues. Hourly employees voted 712-626 against a UAW effort to unionize the plant last February. Since then, the UAW has opened a union local that workers can join voluntarily. 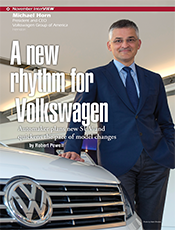 The November issue included an interview with Michael Horn, the president and CEO of Herndon-based Volkswagen of America. He described plans to produce a new midsize sport utility vehicle in Chattanooga and quicken the pace of company model changes for the U.S. market. The Virginia Hospital & Healthcare Association issued a report in October outlining the financial challenges facing many of the commonwealth’s rural hospitals. The report, “Virginia’s Rural Hospitals at a Crossroads,” says that 20 of 37 rural hospitals had negative operating margins in 2012 while 17 had positive margins. Operating margins exclude revenue from investments, financial instruments and other non-operating sources. “In other words, more than half of Virginia’s rural hospitals are operating in the red, some for several years,” the report says. In addition, seven of the 37 hospitals had a negative net worth in 2012, “threatening their viability,” the report says. In November, Virginia Business looked at the growing consolidation in the commonwealth’s health-care industry, with many independent, nonprofit hospitals opting to join larger regional health systems. Hospital officials said declining payments from sources such as Medicare and Medicaid plus increasing government regulation are driving the trend.